This was such a timely post. My wife has had lingering knee pain since we ran a trail race last year December. She has told me that the pain seems to run horizontally underneath the patella, sometimes towards the bottom-side (feet side: sorry for the non-technical location). The pain usually builds throughout the run and is usually dull, but the last run we did (6.5m) it was sharper; the pain usually occurs on impact. Any thoughts on whether it might be serious? I don’t want to spoil the forthcoming post 🙂 but this post was so serendipitous! Thanks for writing it! If the December “trail” race was A.R.E. Adventure race, she’s lucky that’s all that happened. I banged up my elbow, wrist and ankle! It sounds like her pain is likely IT band related, but I’d be a little suspicious of a meniscus injury too. I think “Part 2” of the knee pain post will give you some answers. Yes, the trail race was the A.R.E. Adventure race. Quite the little jaunt! Cant wait to read Part 2. Thanks for the reply. Reblogged this on Fit for a year. I realize this is quite awhile after your original article, but I’ve just come across it and desperately need help! Several months ago, I began having pain (felt like a ball) in the back of my right knee when I would get out of the car or get up from my recliner in the evening. I could never locate it by touch. Then the pain moved to the inside of my right knee just above the bend; the fleshy area. If I squat or kneel quickly, the pain knocks me for a loop!. I can bend my knee, slowly, all the way, and the muscle? not only bulges but is HARD and sore. I have located a very sore area where it seems to attach to the knee. Otherwise, I am unable to locate the pain. I jogged for about 5 years, then moved to power walking for the past 30 years. It’s really bugging me to lay off! What is it and what do I do? Please help!!! Hi Katherine. Thank you for your question. It sounds to me like you’re describing a cyst in the back of your knee. I have seen them many times before. They are typically nothing to be concerned about until they start causing pain and limiting a person’s activity. The problem with giving advice with these type of cysts is that every person responds differently to them. I’ve seen them go away on their own. I’ve seen situations where they’ve been drained by a doctor, only to have them return a couple weeks later. Another common intervention is a cortisone shot. I’ve seen varying results with those as well. I’d suggest you start with an orthopedic doctor to get a comprehensive knee exam done just to make sure there is not a larger problem. Good luck! That’s what I was afraid of. I will have bite the bullet and see one! Actually, I’m prone to cysts. Thanks! And MANY thanks for the quick response! I’m sorry I haven’t found your site earlier. You seem to understand the knee problems better than anyone else I have talked to. If you’re still out there, I would love to hear from you. I have a pain in the medial side of the knee that almost disappears at rest but comes back and gets progressively worse every time I run. It feels like something snags right at the point where the knees would touch if I put them together. If I ignore it and keep running, the pain starts to radiate down into the lower leg until I eventually have to stop. There’s no weakness or other motor function impairment – just pain. Apart from that, the pain is aggravated with the knee fully extended or laterally rotated. Any advice you can offer will be greatly appreciated. Hello Arthur, This sounds like a simple case of adductor tightness. 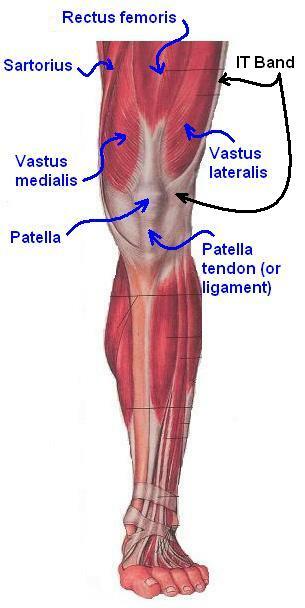 The adductor muscles are typically considered the groin muscles. But there is one that spans the entire inner thigh and attaches exactly where you describe. Your description is very common. A simple fix is sitting on the floor with one knee straight (in my opinion, it’s always best to stretch one side at a time) and the inside of your foot against something that won’t move (a doorway, heavy couch etc.) Slowly turn your hips and shoulders the opposite direction (if your left foot is against the object you’ll be turning to the right) until you feel a light strain or pulling sensation on the inside of your knee or thigh. Hold for 30 seconds then repeat the same process on the other side. Repeat back and forth 3 times each side. It’s an aggressive stretch so start off gently and don’t be surprised if you feel like the pain is worse at first. As you adapt (give it a few days) you should start noticing improvement which can be perceived as less pain or the ability to run further before the pain sets in. Stick with it and within a week I expect you’ll be confident the pain is on its way out. I hope that helps! on August 12, 2016 at 9:43 pm | Reply Gail C.
I had a full left knee replacement 5 weeks ago. Occasionally when I walk I feel a muscle (tendon/ligament) or something snap in the back of my knee. It gives me a short jolt of pain and makes me jerk. Yesterday at physical therapy while the therapist was pressing me knee into the floor mat it snapped again. She was surprised and asked if it was my knee cap. When I said it wasn’t but something in the back of my leg she told me to mention it to my physician when I see him at my six week check up. Any idea what it may be? Hello Gail, I see many strange aches & pains happen during the rehab phase of TKR’s. Every person’s rehab experience is different. Some go very smooth while others have many complications. The snapping sensation would have likely been a tendon that was irritated during the replacement procedure. I hope it has not continued to be a problem now that you are many weeks further into your rehab program. Thanks for your question!